Brooklyn Heights, N.Y. — St. Francis Terriers win fourth straight game by defeating visiting Northeast Conference foe Fairleigh Dickinson University 62-51 on Saturday. With the victory, St. Francis improves to 5-1 in NEC play for the first time since the ’00-’01 season. Back up point guard Brent Jones scored a career-high 15 points in the contest after replacing injured starter Justin Newton after Newton got hurt midway through the first half. Freshman forward Jalen Cannon posted his second consecutive double-double as a Terrier scoring 10 points and grabbing 12 rebounds. Senior forward Stefan Perunicic was also in double-digits for St. Francis with 11 points. Junior forward Akeem Johnson was inactive for the second straight game after starting all 15 previous match-ups for the Terriers. St. Francis took an early 8-0 lead as Perunicic continued his good play from last game by knocking down a three-pointer from the left corner scoring the first points of the game. On good team defense, Fairleigh Dickinson stormed back and tied the game 14-14 with nine minutes to play in the first half. Junior guard Melquan Bolding ignited FDU’s surge by hitting back-to-back three-pointers, giving his team the lead for the first time in the game. Terrier guard Ben Mockford dished two assists, resulting in five points, as FDU led 26-22 with five minutes to play in the first half. Jones did a great job facilitating for St. Francis in the first half as he hit back-to-back shots and tied the score 32-32 for the Terriers before FDU scored and took a two point lead into halftime. St. Francis started the second half by taking the lead on their first shot, a three-point make from forward Travis Nichols. Jones and forward Matt Milk followed up Nichols’ long-distance shot with baskets of their own to put the Terriers up 39-35 after three minutes of play. 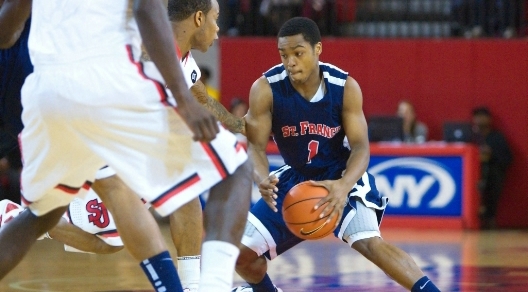 St. Francis then rolled off a 5-0 run to take a 44-35 lead over FDU with 13 minutes to play in regulation. Terrier sharp-shooter Ben Mockford scored his first points of the match on a foul-line jumper that gave his team a 46-37 lead with 10:30 to play. FDU’s lack of bench scoring was evident to this point as St. Francis’ bench outscored FDU’s bench 19-2 thus far. Dickinson’s chances of mounting a comeback were slipping as the Terriers took a 52-39 lead with 7:49 to play. Despite responding with an 8-0 run in the following three minute span by FDU, St. Francis got some breathing room by superb 10-of-12 (83.3%) free-throw shooting. Jones knocks down two more foul-shots as St. Francis goes up 60-47 with just 1:58 to play. The Terriers played stellar team defense in the second half as FDU’s leading scorer Melquan (15 points) was limited to only one point in the final 20 minutes of play. FDU converted 56.5 percent (13-of-23) of their shots in the first half compared to just 25.9 percent (7-of-27) baskets made in the second half. Fairleigh Dickinson made a valiant comeback effort but it wasn’t strong enough to yield St. Francis’ winning streak as the Terriers rack up their fourth straight victory and beat FDU 62-51. St. Francis’ foul-shooting and bench scoring were the keys to their victory as the Terriers made 16-of-18 (88.9%) foul-shots in the game, 12-of-12 in the second half, and shot a blazing 47.6 percent (20-of-42) from the field overall while their bench outscored FDU’s bench 27-5 for the entire contest. St. Francis’ (8-9) next game is Thursday, January 21, as they host conference rival Wagner (13-3).